The last session of 2018 will be on Sunday 16th December. We start again on January 6th. Contact our Mini Kickers Lead Coach, Andy Penfold. 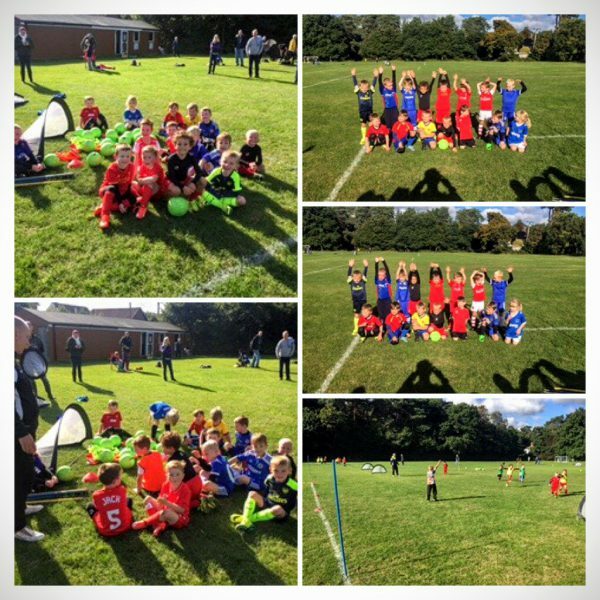 The Mini-Kickers are where it all starts for Mytchett Athletic and over the last couple of seasons we have seen a big increase in the number of Reception and Year 1 children joining the club. For some of the boys and girls, these sessions are the first steps into football and it’s thanks to Alan Wildsmith that the kids get off to a good start. Alan has given many years of service to the club and currently holds the position of Club President. He’s witnessed many changes over the years, but has always said that it’s the look on the youngsters’ faces when they play their first match or score their first goal that makes being a part of Mytchett so worthwhile. The Mini-Kickers train throughout the winter season at the club’s home pitch at Bellew Road in Deepcut. It’s important that at least one parent or guardian or responsible adult accompanies the child to training and is present throughout, for the welfare of the child. There are teas and coffees for sale and even a bacon roll. There is also a raffle for the kids and all the money raised helps this age group moving forward. Children can wear whatever they feel comfortable in for training. Trainers are fine at first, but it’s important they wear shinpads for their own protection. Have fun and most of all enjoy the football.